Some People Who Should Not Go Hiking Trivet is measuring 8w x 8h x .75d. Made of solid wood with padding on back that protects your furniture. 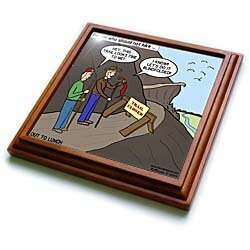 Framed trivet comes with 6w x 6h ceramic gloss tile attached to the wood frame.